Between the state’s K-12 programs, community colleges, state colleges and private colleges, Nebraska offers a wide range of online courses. During the 2013-2014 school year, over 7,500 students in Nebraska were enrolled in at least one online course. Students in K-12 use the Nebraska Online Instruction Source for supplemental courses, blended courses or video conferencing, but the state currently has no fully-online K-12 schools. Multiple public and private universities offer online degree programs and courses in a variety of subjects and degree levels at the post-secondary level. Nebraska is home to an abundance of online schools and colleges that allow students to earn credit and complete their degrees — regardless of their geographical location. Online degree offerings are offered through community, state and private colleges, in virtually any subject area. The University of Nebraska alone offers more than 100 online programs, and distance learning options are offered by all seven of the state’s two-year colleges. E-learners who want to take earn college credit online without enrolling in a full degree program will also find options for taking individual courses from a number of different schools. 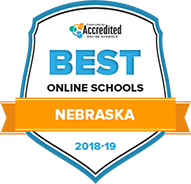 Read on to learn more about the Best Online Colleges in Nebraska for 2018. Creighton University is a private, Jesuit, Roman Catholic institution in Omaha, Nebraska. Established in 1878, Creighton offers more than 30 online degree programs including business, ministry, educational leadership, health professions, finance, and leadership. You can complete bachelor's, master's, and doctoral degrees, as well as several graduate certificates entirely online or in a hybrid format. Depending on the program, courses may be synchronous or asynchronous. Creighton offers distance learners various support services and resources including library research assistance, online tutoring services, and an information technology helpdesk. For some degree programs, you may transfer up to 80 credit hours from previously attended accredited institutions. Founded in 1905, the University of Nebraska at Kearney offers more than 400 online courses, undergraduate and graduate degrees, as well as certificates and professional development programs. You can complete most of UNK's degrees entirely online. Only a few degrees require a hybrid format. Delivered through the Canvas system, UNK courses are asynchronous and prepare students for careers in business administration, criminal justice, history, sociology, and dozens of other traditional degree programs. UNK boasts a diverse and robust set of education-focused majors and specializes in training distance learners to work in early childhood education, special education, Montessori programs, and education administration. For full-time students, undergraduate degrees take about four years to complete, while the master's degrees take approximately two years. Students may shorten that time by transferring previously earned course credits toward their online degrees. Undergraduate students may transfer a maximum of 66 credit hours from two-year junior or community colleges. The University of Nebraska-Lincoln is a public research university that boasts an extensive offering of online graduate degrees. Most degree programs can be completed entirely online or in hybrid formats. In addition to over 30 master's degrees and 18 certificates, UNL offers 2 doctoral and 2 bachelor's degrees online. For full-time students, typical program length is 4 years for an undergraduate degree and as few as 1.5 years for a master's degree. Doctorates in higher education leadership and P-12 school leadership take 4 or more years to complete and require some on-campus obligations for research seminars. Tuition costs vary per major and are different for residents and nonresidents. TheUniversity of Nebraska Omaha is a public research university founded in 1908. UNO offers graduate and undergraduate degrees and certificates online. Distance learners take courses in an asynchronous format, which gives you the freedom to do schoolwork anytime, from anywhere, at your own pace. UNO online programs also feature a hybrid, graduate endorsement option. In this scenario, you can earn a master's degree in education with an endorsement, or specialization, in areas such as bilingual education, social justice education, school library, or science. Online tuition cost per credit varies between degrees and is different for in-state and out-of-state learners. For those seeking a bachelor's or master's degree full-time online, you should expect to spend about two and four years, respectively, completing your graduation requirements. Certificates require about 12-18 credit hours and can take one year or more to finish. Bellevue University is a private nonprofit university located in Bellevue, Nebraska that offers over 75 bachelor's, master's,and doctoral degrees entirely online. For most degrees, hybrid and traditional on campus formats are also available to fit your scheduling and learning needs. At Bellevue, you can also complete a bachelor's degree in an accelerated cohort format. These programs take place over a 72-week timeframe and can often save you time and money. Most master's degrees require 36 credit hours for graduation and take students two years to complete. This school offers only one online PhD, in human capital management, which can take up to 5 years to finish, depending on how long it takes students to complete their dissertation. Tuition cost per credit at Bellevue is the same for both online and on-campus students. Located in Seward, Nebraska, Concordia University is a Lutheran institution that offers a wide variety of online master's degrees and endorsement programs. You may complete courses in both online and hybrid formats. Master's degree programs range from traditional foci, such as accounting and finance, to more current specializations such as MBAs in nonprofit management, risk management and business intelligence. Most of these career-advancing degrees take as little as 2 years to complete. You may be able to transfer credits into Concordia as long as you complete the transfer application prior to completing your course. Up to 25% of your total credits may be transferred from other accredited programs. Concordia only considers a course for transfer credit if as you earned a 3.0, or a "B" grade, or higher. Sitting on the side of the Missouri River, Peru State College is a small community on-campus and a growing presence online. Thanks to their low cost per credit tuition and their acceptance of up to 90 transfer credits, Peru State College has established itself as an online leader in Nebraska. There are four main undergraduate degree areas that online students can study, two of which can be further specialized. Graduate degrees are also offered by Peru, and all courses are offered through Blackboard. By offering in-state tuition to all their online students, Chadron State College has made it easier to get a college education. Flexibility is a large part of their online philosophy since they understand that not all students can study in a traditional manner. Chadron online offers bachelor?s degree completion courses (meant for transfer students) and complete master?s degrees, both of which can be completed entirely online. Students that want to accelerate their education can take any of Chadron?s 8-week online courses. Regardless of where students reside, Wayne State College has affordable and competitive tuition rates. The cost of education can get even lower if students choose to study online. Wayne State offers 3 fully online undergraduate degrees and a variety of master?s degrees, some of which require some on-campus courses to complete. Transfer students can easily bring in credit to reduce the time it takes to complete each program. Their online courses are offered through eCampus, and they?re accessible whenever students want to study. Students considering work in the medical field can choose from 4 online programs to earn a bachelor?s degree at Nebraska Methodist College. These include diagnostic medical sonography, imaging sciences, respiratory care and nursing. You will need to check with each program for their admissions and graduation requirements. Curriculum is implemented in 5-week formats, and enrollees only take 1 course at a time. Online learners can access study guides and tutoring as well as contact the Coordinator of Academic Success for 1-on-1 coaching. Students in grades K-12 can take supplemental courses through the Nebraska Online Instruction Source, which offers 347 online courses to grades 3-12 in 237 districts across the state. During the 2013-14 school year, almost 7,500 students chose to enroll in at least one course. Blended learning is encouraged throughout the state with students taking both traditional and online courses. The University of Nebraska’s high school program offers over 100 asynchronous courses to students throughout the United States and beyond. The Nebraska Virtual Academy offers blended courses to students throughout the state. Nebraska’s community colleges also offer distance opportunities for high school students who want to earn college credit online. Recognized as a leader in distance education for more than 100 years, the University of Nebraska offers more than 100 online degrees, certificates and endorsements. Other state colleges and private colleges in Nebraska also offer individual virtual courses or degrees fully online. The state’s seven two-year colleges provide virtual students with a means to earn their degrees partially or fully online. The Nebraska Community College System divides the state into six geographic regions: Central, Metropolitan, Mid-Plains, Northeast, Southeast and Western. There are 13 campus locations and more than 280 off-campus sites interspersed throughout the state. Each community college also offers online learning options. Additionally, two tribal colleges are located in the state: Little Priest Tribal College and Nebraska Indian Community College. Like most community colleges, Nebraska’s two-year schools have maintained their traditional focus on applied technology, vocational, and occupational education and training. Unlike most state community colleges, however, two-year colleges in Nebraska offer campus housing for students seeking a residential experience. In addition, Nebraska community colleges offer a variety of student activities and organizations, such as Phi Theta Kappa, the international honor society of two-year colleges. Students who wish to go beyond an associate degree can take advantage of the Nebraska Transfer Initiative, a cooperative effort by the state’s public and private higher education institutions that facilitates the transfer of students with an associate degree to a bachelor’s degree program. Nearly 50,000 students attend one of the four campuses of the University of Nebraska, the state’s only public university system. The University of Nebraska–Lincoln, the flagship campus and one of the country’s top 50 public universities, offers more than 150 undergraduate majors and a wide range of graduate programs. The University of Nebraska at Omaha is the state’s metropolitan university, featuring a technology-rich atmosphere and abundant internship opportunities. The University of Nebraska at Kearney is known for its small classes, caring professors and vibrant community of international students. Lastly, the University of Nebraska Medical Center enables graduate students to prepare for careers in health sciences. The Nebraska State College System serves close to 9,000 students through three diverse institutions: Chadron State College, Peru State College and Wayne State College. Together, the three schools offer more than 200 degree, certificate and pre-professional programs. Students can take courses on campus, online, or through one of several satellite locations throughout the state. The Nebraska State College System Advantage, which is renewable each year, guarantees that first-time freshmen who are state residents and who receive federal Pell Grants will not have to pay tuition when attending one of the three state schools. Nebraska is also home to 17 private nonprofit schools, 14 of which are members of the Association of Independent Colleges and Universities of Nebraska (AICUN). These range from religious colleges to schools specializing in areas such as radiologic technology, nursing and other health sciences. According to AICUN, the state’s independent colleges and universities enrolled more 33,000 students in 2010, which translates to more than 22 percent of college students in the state. In 2009, Nebraska’s private colleges awarded 40 percent of all bachelor’s degrees in the state. One of many online schools in Nebraska, the University of Nebraska Omaha (UNO) allows students to choose from more than 50 areas of virtual bachelor’s level study. Some of these programs are offered fully online, and others are blended programs. For transfer students, half of the last 48 semester hours must be completed through UNO coursework. UNO also has a range of online master’s degree programs, including criminology, gerontology, special education, creative writing, public administration and political science. Interested students can learn more about the University of Nebraska Omaha’s online programs at www.unomaha.edu. With the merger of Northeastern Nebraska College and Northeast Nebraska Technical College, a new online school in Nebraska was formed. It offers one-and two-year liberal arts, vocational/career and adult education programs under the same digital roof. At the associate degree level, online students can pursue general transfer degrees or can focus their studies on applied science in business, accounting, agriculture, behavioral science, business administration, criminal justice (corrections and law enforcement) and social science. Northeast also offers online business programs to obtain diplomas and certificates. Online student services include academic advising, campus bookstore, career guidance, writers’ clinics and tutoring. Prospective Northeast students can view degrees and course schedules at https://www.northeast.edu/Northeast-Online/. Through its Office of Online & Distance Education, the University of Nebraska at Lincoln (UNL) offers a wealth of courses and online degree programs to students locally, across the state and throughout the nation. While UNL currently offers only one undergraduate degree through distance learning (Bachelor of Science in Applied Science), it is one of the online schools in Nebraska that boasts substantial online graduate degree options. UNL has a total of 30 master’s and four doctoral degrees, as well as several certificates and degree endorsements that can be earned fully- or partially-online. Of particular note are UNL’s programs for transfer and military students, as well as its online MBA, which has been recognized by a number of sources as one of the nation’s top distance learning programs for business degrees. UNL is currently authorized, licensed or otherwise permitted to offer distance education programs in 36 states. For full information, visit UNL’s website at http://online.unl.edu/. Bellevue University is a private, nonprofit school offering bachelor’s, master’s and doctorate degrees, as well as continuing and professional education programs both online and at their campus in Bellevue, Nebraska. Since its founding in 1966, Bellevue has provided post-secondary education options primarily to local military and adult students. With that in mind, Bellevue is one of the online schools in Nebraska that has a nationally recognized distance learning division. The school offers an extensive variety of distance education opportunities with nearly 50 bachelor’s and 25 master’s degrees, most of which can be earned completely online. All instructors are required to complete a rigorous six-week training program on distance course delivery techniques, ensuring that virtual classes meet the same high standards as those in the traditional classroom setting. Students have the option of viewing lectures live as they are presented, or at a later time that is more convenient. To access Bellevue University’s online program and course offerings, visit their website at http://www.bellevue.edu/ways-to-learn/online-university-degrees.aspx. Chadron State College (CSU) is a four-year public institution located in the small agricultural community of Chadron, in northwest Nebraska. CSU’s online learning program offers access to dozens of courses and degree programs at both the bachelor’s and master’s levels. Features include affordable tuition costs with no additional fees for out-of-state students, a 24/7 student help line, and many courses offered in convenient eight-week sessions. On student transcripts, online courses appear identical to those taken in a traditional classroom format. CSU currently offers 13 bachelor’s degree completion programs, five bachelor’s degrees and 11 master’s degree programs. Like several other online schools in Nebraska, many of these degree programs can be completed either fully- or partially-online. Popular subjects include business, counseling, education, family and consumer sciences, and organizational management. For a more detailed look at Chadron State College’s online learning courses and degree programs, please visit http://www.csc.edu/extended/online/. Nursing or healthcare professionals looking to advance their education and career, may find the online programs at Nebraska Methodist College (NMC) a perfect fit. Designed expressly for busy professionals, online course schedules are more flexible and convenient so degrees can be earned without compromising professional obligations or personal responsibilities. Online programs include nursing, MSN, healthcare management, continuing medical education and allied health programs. NMC is fully-accredited and affiliated with one of the largest health systems in Nebraska. Online instructors are experts in their fields and share their firsthand knowledge and vast experience in the US healthcare market. Creighton University offers a selection of degree programs online as a convenient and flexible option for students who are working full-time. Degree programs offered online range from bachelors to doctorate programs and graduate certificates. Online courses at Creighton aren't one-way; they are designed to incorporate a great deal of interactivity with the subject matter as well as the online instructor and classmates. Classes may include audio-visual components such as videos, or students may complete and submit an e-portfolio of their work for comment. Students begin with new student orientation to introduce them to the online learning environment and have access to a 24x7 help desk for technical issues, a student services coordinator, financial aid advisors, and a career services department. With its roots as a teacher's college, it's no surprise that Wayne State provides excellent online programs for educators. Through Wayne State's Distance and Continuing Education program, educators will find affordable and convenient, self-paced and computer-based courses. The self-paced courses were developed by Learner's Edge, Inc. and contain proven strategies to improve teaching and student learning. Computer-based classes are delivered via CD-ROM or online and were developed by Virtual Education Software. These classes are intended for certificate renewal or personal enrichment. Teacher certification renewals are also available through the Distance and Continuing Education office. Chadron State College has long served as one of the leaders in distance education. As the institution has sought to serve its vast service region and other areas of the Great Plains and beyond, it has capitalized on cutting edge technologies. Chadron State's online learning program offers courses in an accelerated eight-week format. There is no out-of-state tuition and all undergraduate students pay $246/credit hour. Online programs include: bachelor's degree completion programs, complete master's degrees, elective or general studies courses and alternative teacher certification courses. Students are provided with 24/7 support for online classes and coursework will be delivered completely online. Coursework includes assignments, projects, papers, quizzes and exams; all delivered through a virtual classroom environment. Bellevue University has designed their online learning experience to apply real-world learning experiences with the needs of busy working adults. A diverse assortment of bachelor's and master's degrees are available completely online. Small class sizes combined with 24/7 course access, dedicated professors and access to library and support tools contribute to the flexible, supportive environment Bellevue strives for. Some programs are available in a hybrid-model, combining online and on-campus learning. Bellevue has created their own online learning model called B.R.U.I.N. where students can check grades, review class schedules, makes payments and perform dozens of other tasks. University of Nebraska Omaha offers degree and non-degree programs through their Online Worldwide program. UNO offers over 20 fully online and blended (online and on-campus) degrees. New online students are required to attend the one-day on-campus mandatory orientation prior to the start of beginning their course work. Students build their learning community, meet their faculty and advisors, and learn about the library resources and technology assistance to support academic needs. Whether students live in Nebraska or are studying remotely from another country, everyone is welcome to complete their degree at UNO. The University of Nebraska-Lincoln has spent 100 years perfecting their distance education program. Now expanded to include online, the Office of Online and Distance Education has taken the same quality classes offered on-campus and adapted them to create flexible online courses. Online only and blended/combined (online and on-campus) degree options are available. The most flexible of all majors offered is the Bachelor's Degree in Applied Science. This program allows students to take all required courses online at a self-set pace. Master's and certificate programs are available as well. The school encourages all students to add a minor to their degree and many are offered completely online. The University of Nebraska Medical Center's College of Allied Health Professionals offers degree advancement programs for professionals already working in the field. The program is geared for students who want to earn a degree while still keeping current jobs. The program has "Individual Plans of Study" to target furthering students' educations, while taking clinical and educational backgrounds into account. Students have five years to complete each degree. The distance-learning program is flexible so that students may work education into their busy schedules. Students have the option to complete bachelor degrees in clinical laboratory science or radiation science technology. Across Nebraska’s collegiate programs, serving our country is taken as seriously as sports. Nebraska’s higher education offers many ROTC branches to students. Army, Navy and Air Force ROTC are all represented in the state’s post-secondary education. We've created this list of all four-year, nonprofit Nebraska colleges that also provide at least two ROTC programs for both undergraduates and graduates. If budget is a factor, note the highlighted selections that distinguish the programs with affordable annual tuition. Nebraska college students have a wide range of choices in excellent post-secondary degree programs. The schools listed below offer more than just a high quality college education. Each offers manageable student/professor ratios, with average class sizes of less than 20 students per professor. There are several great online schools in Nebraska where women can earn a degree in technology, typically a male-dominated profession. Colleges in Nebraska have developed programs to encourage women to enter and excel in technology degree programs. Female-only residences, mentorship programs, support groups and specialized conferences support these ambitious women as they work toward lucrative careers. For women interested in pursuing a degree in technology, below is a list of outstanding programs in Nebraska from which to choose. Social work is a rewarding career for those looking to help others. Online schools in Nebraska have quality social work programs led by exceptional faculty members, allowing students access to hands-on opportunities and real-life experience. Scholarships and fellowships help to drive down the cost of a college education, making a degree in social work more affordable than ever. Considering factors such as college reputation, available internships and academic facilities, we’ve compiled this list of the best social work programs in Nebraska.